Good morning, I hope everyone is having a great week. I’ve been very busy getting ready for Christmas and finally finished all my Christmas cards, at least I hope so, lol. Today I am sharing one of those Christmas cards with you. I have some great news to share with you as well, I am now a design team member for the 2 Crafty Girls Challenge Blog. How awesome is that? I had this brilliant idea that doing digi stamps for some of my Christmas cards, would be quicker then paper piecing them. Well, I was wrong. It actually took a little bit more time to paint the digi stamps, but I enjoyed every minute of it. 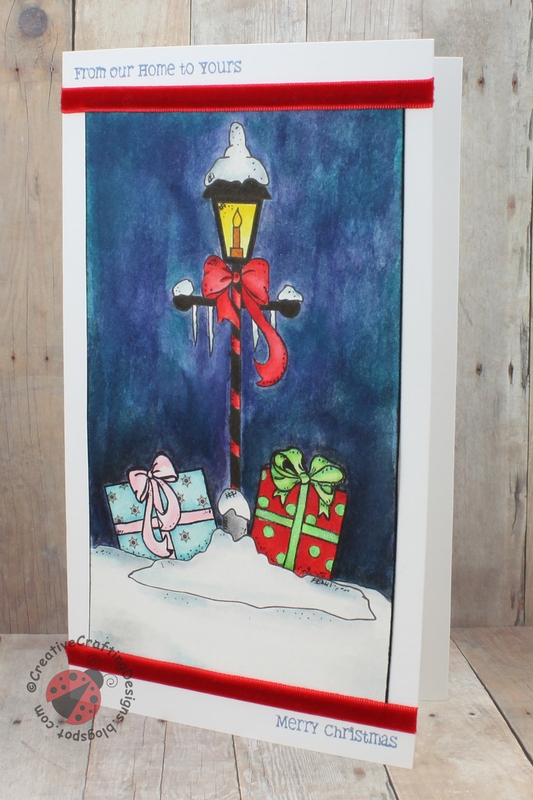 I used Christmas Gifts and Snow Covered Lamp Post digi stamp by Pattie’s Creations and printed them out on Canson watercolor paper. Before I printed them out I pulled them into Adobe Photoshop, removed the white background and saved them as a PNG file (there are free software’s and websites you can use to do that; just do a Google search). I then pulled the PNG images into Adobe Illustrator and layered them so the presents seemed to be sitting in the snow (you can also use Inkscape to do this, it’s a free software). To paint this digi stamp I used Tim Holtz Distress Inks and a little bit of water. My parents actually just got me the inks for my birthday, they are the best… Thank you Mom and Dad 🙂 For sky I used the inks as well but after I painted in some color, I used the round small blending tool to blend in some of the ink. For the areas closer to the image I removed the sponge from the tool, folded it in half to blend the ink in those areas. For the green ribbon and polka dots on red present I used a glittery gel pen. Now, my glittery gel pens seem to not work right so I actually take them apart, pulling out the ink compartment, and tapping the end of it on a plastic palette, then applying it with a paint brush (I put the pen back together when I’m finished). I finished up my digi stamp image by using a black Zig Millennium Pen .01 to add some fine line detail. Now for the card base itself, I decided to keep it simple by using white Recollections cardstock which I cut with my Cricut Explore. I then attached my painted digi stamp using an Elmer’s CraftBond Tape Runner. I thought it needed something a little more so I trimmed the top and bottom of the painted image with some red velvet ribbon. I finished up the front of my card by adding the sentiment “From our Home to Yours” and “Merry Christmas” using the Winter Wishes stamp set by Jaded Blossom and Tim Holtz faded jeans distress ink. I got a bunch of Jaded Blossom stamp sets on Black Friday, they had an awesome sale going on. But, they are a Christmas present from my husband. I couldn’t wait until Christmas I just had to use them, well I actually needed to use the Christmas sets. So, shhh, do tell him I used them before Christmas, lol. So now onto the inside of my card. 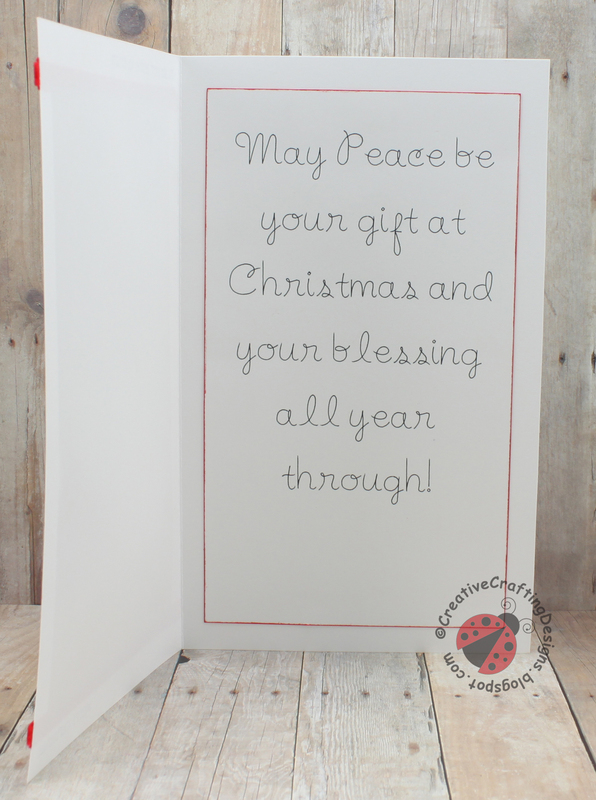 I used my Cricut Explore to write the sentiment “May Peace be your gift at Christmas and your Blessing all year through”. I used the font Baby Steps in the has a writing style setting and a Pilot Precise V5 black pen. I love using that pen in my Cricut, it fits perfectly in to the pen housing and writes so smooth. I added the red trim using Tim Holtz barn door distress ink by running the ink pad along the edge. I attached the sentiment using my tape runner. Thank you so much for stopping by my blog today, I hope you enjoyed my post. Make sure to hop on over to the 2 Crafty Girls Challenge Blog and check out the Anything Goes Challenge.